Ramblings on Running, Motherhood and Life...: Busted!!! They made me put on shoes! So, I was running at our local indoor track as I have been for the last 2-3 months. I have been cross-training there as well as a little coaching with some friends. About 20 minutes into my 30 minute run, I was pulled over by one of the staff members and asked to put on some shoes. Admittedly she caught me at a bad time. NEVER interrupt a runner half-way through her run; NEVER interrupt her if she has been listening to NIN, and NEVER ask a barefoot runner to put on shoes because of 'health and safety'. After a growl - yes I think I actually growled at her, and I mumbled something about if I could count them liable if I broke my feet because I put on shoes, we had a talk. She cited that 'I may step on something and sue them', at which point I mentioned I had eyes and would not deliberately go out to hurt myself. She said, 'that if people saw me run barefoot, they may feel they could do it too', at which point I mentioned that will probably happen. She actually seemed quite receptive. I told her about how I felt running shoes had altered my gait so much it caused me to break two bones in my left foot. This shocked her as I think most people still perceive that no shoes cause injuries. I talked about gait, about heel-strike, about how the foot/calves are designed to act as shock absorbers. 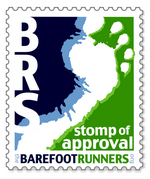 I talked about the new evidence backing this, the recent publicity and the sudden interest in barefoot running. I also mentioned that I thought I would not be the last that would try to run barefoot on the track. She decided to contact the manager and I have offered to help in providing the information, setting up a waiver and helping develop an understanding of barefoot running. We just have to see how that pans out. In the meantime I have decided not to play rebel and put something on my feet. So today I had to take my trusty Vibram KSO's onto the track. *grumble*. I could only run about 25 minutes before the usual 'Vibram seal blisters' appeared. However I think the run proved a few points for me. I was about half way through my run when some high school boys came to the track. They tried to catch me up and whenever they came close I would put on a sprint and leave them behind. They then saw that I wasn't wearing running shoes, so they TOOK their shoes off and tried to catch me in socks. I still beat them. I went to put on my shoes to continue my cross-training in the gym room and they looked at me and asked if they could have one last lap. I had my shoes on... I told them I probably would be slower, but I still beat them. So what did the run prove? That I am a better runner because I don't wear shoes and the form I have learnt crosses over to when I DO wear conventional shoes (although I hate it). That even wearing 'Vibrams' will not stop people copying me and taking of their shoes. And that beating high school kids in races IS a blast! Just stumbled across your blog via a post in the "huaraches" Google Group. Interesting read, as a member of that group was having a similar situation at a track he runs at. Anyway, looking forward to reading about your adventures! Now I am worried... I thought I was just ranting, raving and rambling into the ether. :) I suppose I had better put more thought into my posts. I had also better proof read it a bit more carefully to. Scott, I going to go back to the centre later in the week and see if they have made a decision. Really don't want to run on the track in Vibrams as it throws my form off badly. Thanks to both of you for your support. Nice to know. I thought so too with mine, then I noticed I had followers. Although, I like to ramble, so if anyone can stay awake through it, I'm impressed. I haven't done any true barefoot yet, but I'm waiting for it to warm up. I can understand about the form though. I hate regular shoes of any sort since going to my Vibrams.